Lee Perry, also known as "Scratch," was born in a rural section of Jamaica in 1936. Intent on making it in music, Perry moved to Kingston in the late 1950s where he began working for a series of studios. In 1968 he broke out on his own, established a new label and issued a string of hits, including People Funny Boy and Return Of Django. Perry was instrumental in introducing remixing into the reggae sound. He worked Bob Marley and later with The Clash, Paul McCartney and the Beastie Boys. 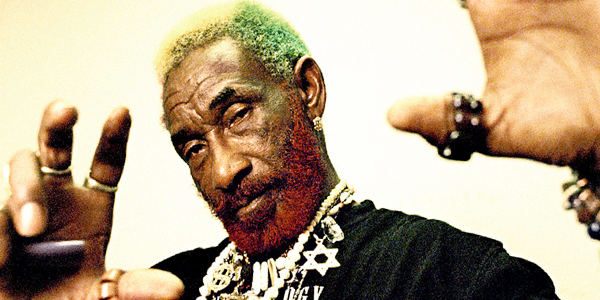 A pioneering reggae artist and music producer, Rainford Hugh Perry (later known as Lee "Scratch" Perry) was born March 20, 1936, in Kendal, Jamaica. Raised in a rural, poor section of his home country, Lee Perry harbored dreams of making it big in the world of music. In the late 1950s, Perry set out to pursue his dream, moving to Kingston, where a new musical genre, reggae, had grabbed hold of the city and the growing recording industry. As a young man trying to carve out a living in the music world, Perry took any work that came his way. Hired as a handyman, then a janitor at different music studios, he slowing worked his way up the ladder until he was writing songs. Perry eventually hooked on with Clement "Coxsone" Dodd, founder of Studio One, an influential recording studio, where a young Bob Marley would soon be crafting his sound. But Perry's relationship with Dodd proved turbulent, and after falling out with his boss, he started work at Whirl Records with its head man, Joe Gibbs. Just as he had with Dodd, Perry had his problems with Gibbs and in 1968 exited Whirl and ventured out on his own to start his own label, Upsetter. The decision to go into business for himself proved to be masterful. The same year he opened Upsetter, he released the company's first single, a track he wrote and sang himself, "People Funny Boy," which served as a direct attack on his old boss, Joe Gibbs. Innovative for its early use of a sample, the single became a success in Jamaica and helped pave the way for even more sales with his next release, Return Of Django, in 1969. The album didn't just have lasting power in his home country, it made Perry a star in the United Kingdom, where it enjoyed considerable sales. From that point on, Perry rolled out a succession of hit singles under a variety of pseudonyms such as "Jah Lion," "Pipecock Jakxon," "Super Ape" and "the Upsetter." As his star power grew, so did his penchant for wearing outrageous clothes and delving deeper into more experimental sounds. Out of his early interest in sampling came Perry's full embrace of dub music, an off-shoot of reggae that relies heavily on remixing previous recordings. In addition to his own music, Perry also started working with other artists, most notably Bob Marley and the Wailers. His work as a producer inspired Perry to create his own studio, Black Ark. By the 1970s, Perry's renown as a producer propelled him into work with various non-reggae artists, from The Clash to Paul McCartney. Later, he worked with the Beastie Boys. Following the death of Bob Marley in 1981, Perry left Jamaica and moved to England. Over the next several years, he remained largely a quiet figure, fueling speculation that he was coping with drug problems and had suffered a nervous breakdown. He eventually relocated to Switzerland (where he continues to reside), and eventually began to make music again. In 2006, he enjoyed a successful return to the road, touring parts of the world as a solo artist. The film The Upsetter, which tells the story of Perry's unique life and documents the musician's endurance, was released in 2011. Perry, who says he's now sober and has seems to have found religion, has his own theories as to why his music continues to resonate with fans and new reggae listeners. "My music is for people who believe in god," Perry said in a 2012 interview. "So if people believe in God this is what my music can do for them. The people believe in Jesus Christ, it can help them. But if they believe in the Antichrist it cannot help them. People who believe in God make music will hear positive words, perfect love and it will heal their soul. If they believe in the devil it can't help them."